Every issue of Raspberry Pi Geek is an adventure, with ingenious applications, cool projects, and expert, how-to advice on configuring, programming, and hardware hacking the Raspberry Pi, Arduino, and other maker board systems. 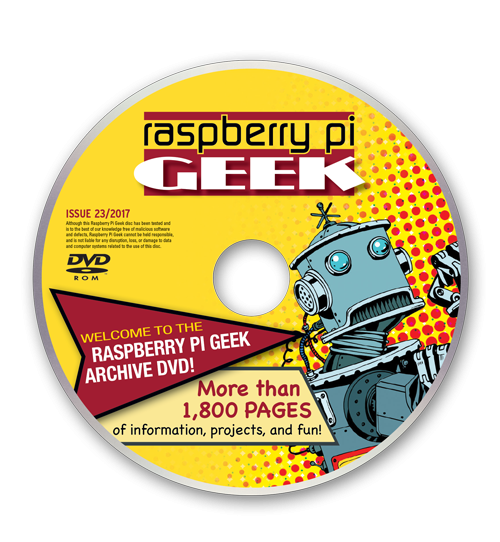 This fully-searchable DVD includes 22 issues of Raspberry Pi Geek in both HTML and PDF format. You'll find do-it-yourself real-world projects as well as tutorials to help you build your skills in Linux, electronics, breadboarding, analog devices, project design, integrated development environments, and more! Our Kid Stop section (included in every issue) features articles for kids, by kids. You can learn how to program in visual block-style languages, such as Scratch and Node-RED, as well as traditional languages like Python and C.
If you love to tinker and want to create your own projects, you don't want to miss the Ultimate Raspberry Pi Geek Archive. Order now and start exploring today!